This week, Camp Green visited Prahdan Farms, a turkey farm near Wheatland, Indiana. Jaleigh Harlow, one of our Day Camp counselors, and her family own Prahdan Farms and invite our day campers to visit their agricultural operation. The day campers learned about the storage, benefit and use of turkey manure on Prahdan Farms. As they held their noses shut, campers were surprised to learn that manure can be used as a fertilizer for crops and that it can be extremely beneficial to the crop’s overall health. Mark Harlow, owner and operator of Prahdan Farms, showed the campers the inside of a turkey barn. He taught them about the litter they use to cover the barn floors and explained that it is made out of rice hulls for safety and biodegradable purposes. He showed the campers how the feeders and water jugs work to keep the turkeys happy and healthy. Mark showed the campers the anatomy of a turkey and explained which parts humans like to eat. 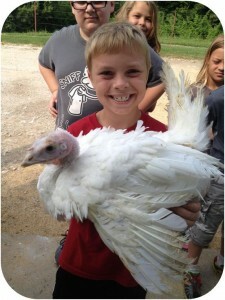 The campers were thrilled to hold one of the turkeys, see how it weighs and feel its feathers. The campers spent the rest of their trip doing fun activities with Jaleigh’s mother, Jonell Harlow, who works as an elementary school teacher. They played games involving teamwork with pool noodles and even painted boxes to help Mrs. Harlow with a project she’s been working on.